Freshwater fish are an important part of the diet of many peoples around the world, but it has been unclear when fish became an important part of the year-round diet for early humans. 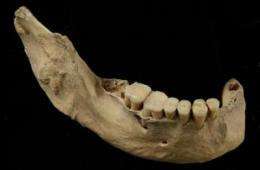 A new study by an international team of researchers, including Erik Trinkaus, Ph.D., professor of anthropology in Arts & Sciences at Washington University in St. Louis, shows it may have happened in China as far back as 40,000 years ago. The study will be published online the week of July 6 in the Proceedings of the National Academy of Sciences. Chemical analysis of the protein collagen, using ratios of the isotopes of nitrogen and sulfur in particular, can show whether such fish consumption was an occasional treat or a regular food item. Analysis of a bone from one of the earliest modern human in Asia, the 40,000-year-old skeleton from Tianyuan Cave near Beijing, has shown that at least this individual was a regular fish consumer. This analysis provides the first direct evidence for the substantial consumption of aquatic resources by early modern humans in China. Since this occurs before there is consistent evidence for effective fishing gear, the shift to more fish in the diet likely reflects greater pressure from an expanding population at the time of modern human emergence across Eurasia.